My goodness does time fly! It’s Friday again and that means another Five Favourite Friday! Are you getting sick of these yet? Tim’s turn to pick the topic this week, and he’s opted for participation sports. He said that these are sports that we’ve played. I’ve not played anywhere near 5 sports so I’ll be adding to my top 5, sports I’d like to participate in or have a go at as well as sports I have played in the past! 5. Fencing. I’d love to have a go at fencing. It’s always looked so cool don’t you think? 4. Ballroom Dancing. Apparently this is classified as a sport. I did have a go at ballroom dancing when I was very little and at the time I did not enjoy it, I thought it was too slow and a bit dull. But as I’ve gotten older I’ve started to see the beauty in ballroom dancing and would love to try it again now! 3. Swimming. I love swimming! I don’t go nearly as much as I’d like to! I would like to try to take Alex a bit more this year too. 2. Yoga. I love Yoga. It’s very calming and when followed up with some quiet meditation it’s one of the best things in the world. 1. Rounders. I used to play in school. It’s one of the best sports around! For my wonderful American buddies out there, rounders in basically baseball – hit a ball with a bat, run around some posts and score ’rounders’ by getting all the way around without being caught ‘out’. My honourable mentions this week include Netball, Judo, Boxing, Golf, and Running. I hope you enjoyed this week. Next week it’ll be my topic and I’m going to go with Children’s Apps, apps that me and my partner have tried and tested! 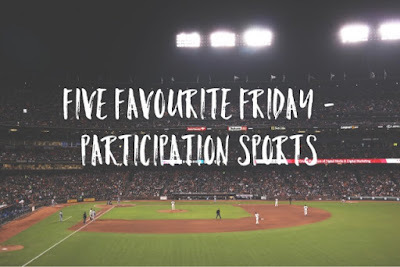 Let me know in the comments your favourite participation sports and also if there are any apps you think we should try out before next Friday!